Named reagents have a slightly mysterious air to them, conjuring up (for me, anyway) the image of a lone scientist working long hours for an elusive goal, until they finally have that “Eureka” moment. In this vein, while “Rearden metal” may solely be a work of fiction, “Raney Nickel” is very real. Raney nickel is an alloy of aluminum and nickel, which has subsequently had much of the aluminum removed through a leaching process with sodium hydroxide (NaOH). The remaining alloy has a very high surface area and also contains hydrogen gas (H2) adsorbed on the nickel surface. What it’s used for: Like palladium on carbon (Pd/C) and platinum on carbon (Pt/C), Raney nickel can be used for the hydrogenation of alkenes and alkynes. But what Raney nickel is used most for is its unusual property of reducing C-S bonds to C-H bonds. It’s this second application that can make Raney nickel uniquely useful. 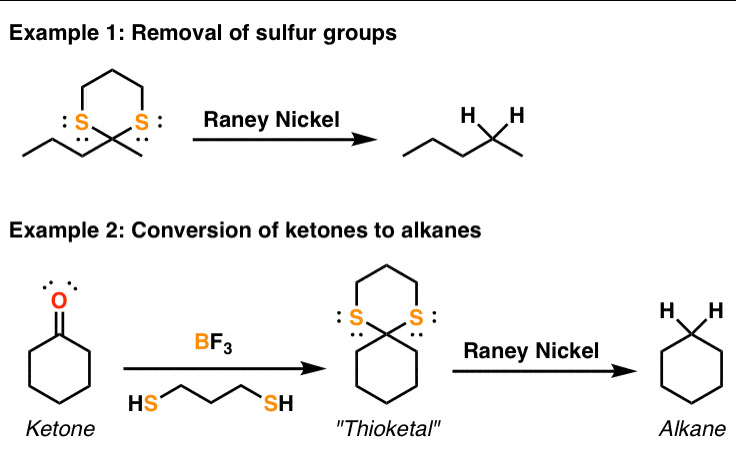 When combined with the formation of a thioketal from a ketone, this can serve as an alternative means of converting ketones to alkanes (just like the Wolff-Kishner reaction). For a real-life application of this reagent in the synthesis of erythromycin by Nobel Laureate R.B. Woodward, see the great discussion by B.R.S.M. here. Here’s the second application of Raney nickel – as a catalyst for hydrogenation. Note that in this case we don’t necessarily need to add hydrogen gas (although it helps) – Raney nickel is usually obtained in its “activated” form, where the hydrogen is already adsorbed onto it. How it works: “For our purposes” (love this phrase) it’s not so important exactly how Raney nickel works. There’s something mysterious about it: the aluminum is crucial for its activity, and Raney Nickel doesn’t behave the same once it’s been completely removed. To be honest I plead ignorance on exactly how Raney nickel works its desulfurizing magic, although the catalytic hydrogenation process is likely similar to those of Pd/C and Pt/C. Real life tips: Perhaps a better description for Raney nickel is “Raney Mud”, because that’s what it looks and feels like. Raney nickel resembles a kind of mud or wet clay, and is actually stored in water. Determining the exact molar ratio of Raney nickel to use is also something of an art – rather than “moles”, typical procedures call for “teaspoons” [I’m not sure I’m aware of any other reagent that calls for this unit of measurement!] After dispensing (but before placing in the reaction vessel) the metal is then rinsed with water (to remove aluminum salts and ensure neutral pH). This can be something of a dicey prodedure since Raney nickel will spontaneously combust in air when traces of moisture are removed. Excess Raney nickel on benchtops, spatulas, weighing paper, etc. should be (carefully) destroyed with acid. There’s nothing like setting up your reaction and then, out of the corner of your eye, noticing little flames coming from traces of Raney nickel on your weighing paper. Disclaimer: this paragraph should not suffice as training in the use of this reagent, which can be extremely dangerous in the wrong hands. P.S. You can read about the chemistry of Raney Nickel and more than 80 other reagents in undergraduate organic chemistry in the “Organic Chemistry Reagent Guide”, available here as a downloadable PDF. The Reagents App is also available for iPhone, click on the icon below! Thank you! should have done that myself. Thanks for the link (and reminding me that my ex still has my copy of Atlas Shrugged)! I also have no idea exactly how desulfurisation occurs, and I’m totally fine with that. Reduce with Pt/C or Pd/C under high pressure of hydrogen. Go to March’s Advanced Organic Chemistry for literature links and other suggestions. When one does a hydrogenolysis with Raney-Nickle, is it valid to keep the reaction under a hydrogen environment in order to shift the adsorption-reaction equillibrium towards the hydrogenated product? This I have done and wonder if it also applies to the palladium/carbon catalyst. I’ve only used Ra-Ni on a few occasions (for hydrogenation) but I used it under an atmosphere of H2. In theory it might be possible to run hydrogenations without it due to the fact that Ra-Ni has adsorbed hydrogen. With Pd/C there is no adsorbed hydride, so you must use an atmosphere of H2, or alternatively use a slightly different source of hydride, like ammonium formate. Is there a source for solid Ra-Ni screen or plate material in small amounts? Or is this even the best cathode material for a hydrogen gas generator? Why raney nickel got DM water wasing before use in reaction. What’s activity status of raney nickel in neutral ph. Raney nickel is slightly acidic, hence the wash to remove traces of acid. the amount of adsorbed hydrogen depends on the grade of nickel used – Johnson Matthey have at least 30 and more if you ask nicely. Grace (who own “Raney” as it’s a trademark) have their own grades again. Each has their own merits. Even though desulfurisation is catalytic, an excess of nickel is usually required. I’ve had some nice selectivity enhancements through using the aluminium-nickel alloy with the substrate and controlled addition of NaOH – this makes Raney nickel in situ and generates hydrogen simultaneously, hence why controlled addition helps. Add the NaOH too fast and you lose too much hydrogen and gain a large exotherm! In my experience the Raney slurry is usually basic due to the process. Hi! Wonderful work, and Thank You very much. I’ve got one small question though. Is reduction using Nickel as more effective than when using Platinum catalyst? I’ve seen Nickel not only reducing double bonds and triple bonds to single ones but also reducing aldehydes and ketones to alcohol. I don’t think Platinum reduces ketones or aldehydes to alcohol. Is this true? It depends on whether you are asking about some reaction in your course or if you’re actually doing this on a practical level. I see some courses where instructors say that Ni will reduce carbonyls while Pd will not, and others where there is no distinction. For more information I suggest you look up Pd and Ni in Encyclopedia of Reagents for Organic Synthesis, or March’s Advanced Organic Chem. The short answer is, given enough pressure of H2, even Pd/C will reduce carbonyls. Could Raney nickel reduce acetal ? And are there any limitations in using Raney nickel? No, acetals are inert to reduction. One trick with Raney nickel, however, is that it is quite acidic if it isn’t washed thoroughly with distilled water. If an acetal is being reduced by Raney nickel it is because the acetal is being hydrolyzed by acid and the resulting aldehyde is being reduced to an alcohol. Can raney nickel reduce polar multiple bonds such as aldehydes or ketones? And can raney nickel reduce conjugated(in conjugation with aldehyde or ketone)non polar multiple bonds? Yes, Raney nickel will do this, but you will likely need increased pressure of H2 and perhaps elevated temperature. I believe the reaction you show for reducing a ketone to a methylene derivative is formally known as the Mazingo Reaction. It might be useful info to add. Speaking of which, is there a reason to NOT use the Mazingo Reaction, in favor of either the Wolff-Kishner or Clemmensen reductions?